For the third straight NHRA Mello Yello Countdown to the Championship race, there was a different points leader by the end of the event in Pro Stock Motorcycle. After winning last weekend in Dallas, former class champ LE Tonglet hopes that is a trend he can break starting at this weekend’s 11th annual NHRA Carolina Nationals at zMAX Dragway. 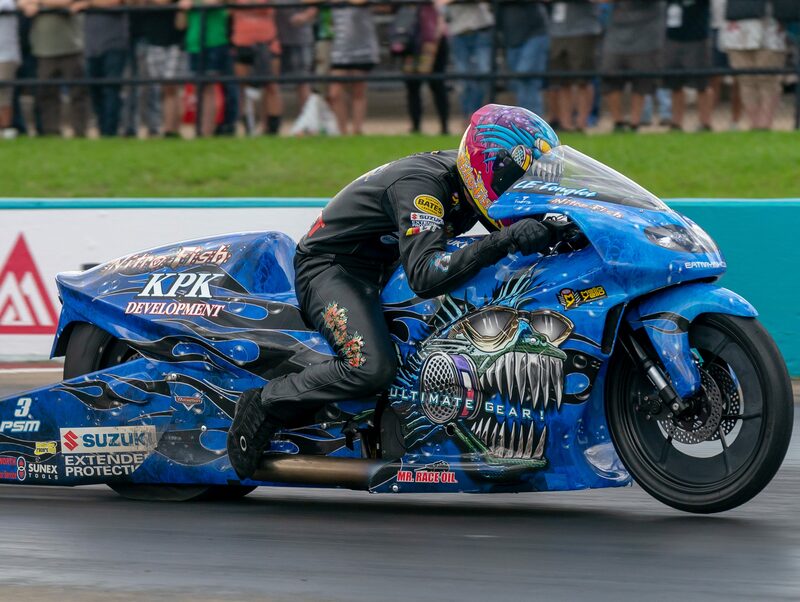 Making his second straight final round appearance in the playoffs, Tonglet picked up his fourth win of the year on his Nitro Fish Racing Suzuki, opening up a 47-point lead on defending world champion and event winner Eddie Krawiec, who was the leader after the Countdown to the Championship opener. Matt Smith, who now trails Tonglet by 48 points, was the leader after winning the second race, but Tonglet is ready for a continued stay at the top after this weekend. Doug Kalitta (Top Fuel), Robert Hight (Funny Car), Tanner Gray (Pro Stock), and Krawiec (Pro Stock Motorcycle) were last year’s winners of the event that will be televised on FOX Sports 1, including live final eliminations coverage starting at 2:00 p.m. (ET) on Sunday, Oct. 14. It is the fourth of six races in the Countdown to the Championship and the 14th of 16 races during the 2018 NHRA Mello Yello Drag Racing Series season in Pro Stock Motorcycle. It’s been another standout year for Tonglet, who has 10 wins over his last 28 races dating back to last season. Two of those have come in the past four events, as Tonglet and White Alligator Racing teammate Jerry Savoie appear to be getting hot at the perfect time. Tonglet knocked off Krawiec in the semifinals in Dallas, setting up a match-up with Savoie, the 2016 world champ, in the final round. Tonglet won with a 6.892 at 194.80 mph, but Savoie remains in the title hunt, staying 109 points back, while Tonglet hopes that situation can repeat itself at zMAX Dragway. Tonglet is excited for those moments and heads to Charlotte looking for his third career win at the state-of-the-art facility. He won the fall race in 2010 en route to his championship and the standout will look to continue to take advantage of opportunities this weekend. In Dallas, he pounced when Smith was upset in the opening round and it couldn’t have turned into a better end result.